The iPM Apex Smart Doorbell is a revolutionary new way to secure your home, always know what is going on, and provides safety and convenience that works on any home and includes a built-in rechargeable battery pack. Now you can watch over your home in HD video, and see, hear and speak to visitors from anywhere. With motion sensing alerts, two-way talk, night vision, video recording and more, you can answer the door from your smartphone, anywhere in the world! Use with your existing doorbell wires! The Apex Doorbell comes with an included rechargeable battery that provides the extra power needed to run a high level IP camera even through the low-voltage wires that your regular doorbell provides. Simply attach the existing wires to the easy to assemble connector that's provided, and your doorbell runs 24/7! Includes Door Chime! If you are away from home and your family is home, and the bell rings, now everyone inside the house will know someone is at the front door. We include the door chime with every doorbell, and you can plug it in to any outlet in your house. Uses the revolutionary iPM Apex app to connect! 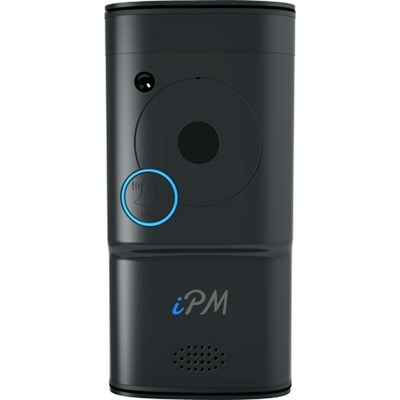 Our brand new iPM Apex app provides the easiest and simplest instructions to connect your doorbell to your phone and the internet. You can connect via Ethernet hardwire (will always be better, but not necessary), or you can use the app to connect via Wi-Fi, using our exclusive QR Code scanning method never having to leave the app to connect! Includes screws to secure your doorbell - we include micro screws to connect your doorbell to your home, ensuring no one walks away with your bell!